When an attack by Chronos forces The Waverider to make an emergency landing in Star City 2046, the team is confronted with an image of a future where they fail to stop Vandal Savage and never return home. This potential Star City is a lawless hellhole where crime and corruption run rampant. For most of the team, it's a disturbing reminder of the price of failure. For Heatwave, however, it's paradise. Now, as Jax and Ray ponder a romance with Kendra while repairing the ship, Sara will go off the reservation to learn more about the future of her city. Specifically who is the new Green Arrow that is fighting a one-man battle to save Star City? And whatever happened to Oliver Queen? The Dark Knight Returns (an older, one-armed Oliver Queen, fighting the god fight alone), Escape From New York (the general aesthetic of Star City in this dark future) and the Green Arrow comics of Chuck Dixon (character of Connor Hawke). Caity Lotz shines the brightest once again in this episode, easily carrying the weight of the episode on her shoulders. For obvious reasons the main focus of the story is on Sara and Lotz proves more than capable of holding that focus. It's an odd thing given her intended role on the team, but Sara has quickly become the moral heart of the team, calling Rip on his BS about not getting involved. Stephen Amell plays an entirely different Oliver Queen in this episode but - as with the various versions of the character he's played on Arrow - he does it well. The fight sequences are all top-notch, particularly Connor Hawke holding his own against all the Legends and the final sequence with an older Green Arrow fighting the new Deathstroke. The set-design for post-apocalyptic Star City looks great. In the comics, Connor Hawke was Oliver Queen's illegitimate son by ex-lover Sandra "Moonday" Hawke. A free-spirited hippie and daughter of a Korean immigrant mother and African-American soldier father, Sandra never told Oliver about their son. Oliver would not learn about Connor until years later, shortly before his death. Connor had been raised in a Buddhist ashram, and taught the ways of aikido archery, though he was a more proficient martial artist than he was an archer. Connor then took up the name of Green Arrow to honor his father's legacy, eventually earning membership in The Justice League. In the New 52 Earth 2 reality, Connor Hawke is also the name of a hero called The Red Arrow. Curiously, this version of Connor Hawke bears a physical resemblance to the comics version of Roy Harper, being a Caucasian man with red hair. The DCTVU version of Connor Hawke is John Diggle Jr. He adopted the name Connor Hawke, believing himself unworthy of his father's name after he failed to save his life at some unspecified point. The significance of this is not explained. The new Deathstroke is identified by the name Grant Wilson and is confirmed to be the son of Slade Wilson. In the comics, Grant Wilson was Slade Wilson's eldest son, who underwent similar treatments to the process that turned Slade Wilson into a super-soldier under the supervision of HIVE. Dubbing himself Ravager, he sought to destroy The Teen Titans. The DCTVU version of Grant Wilson isn't given much of a definitive background. We learn that he lead an army against Star City in 2031 and that most of the city's heroes were killed in the battle that followed and that Oliver Queen lost his left arm. 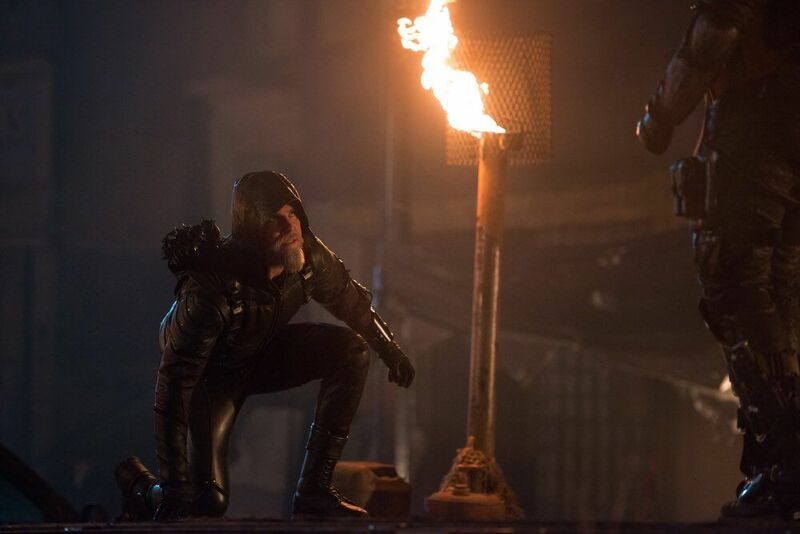 The design of 2046 Oliver Queen is a nod to his portrayal in the classic graphic novel The Dark Knight Returns. That story, also set in a dark future, featured a one-armed, senior-citizen Oliver Queen, who was apparently the only active independent superhero until Batman came out of retirement. Heatwave dubs two of the members of his gang Fonzie and Kenicke. Fonzie was a character from the show Happy Days. Kenicke was a character from the musical Grease. Both characters were meant to be 1950's tough-guys. Oliver says that all of Smoak Technologies old equipment is being kept in a warehouse on Adams and O'Neil. This is a nod to artist Neal Adams and writer Dennis O'Neil, who worked together on the now legendary Green Lantern/Green Arrow run that redefined Oliver Queen as a modern-day Robin Hood. In addition to the propulsion system being "jacked" as Jax puts it, The Waverider also suffers damage to the Neuromorphic Interface for Gideon's logic and navigation matrix. Without it, Gideon cannot function. Palmer Tech was working on a self-learning, Neuromorphic Cortex in 2016. Connor Hawke's costume is made of high-density Kevlar, capable of repelling bullets at point-blank range. At one point, Ray works on repairing something called a quantum manifold. Rory: You know what I think? I think you think too much. Rip: No, no you are not. You're too emotionally connected to the city. We've been over this. Sara: I'm over you. You got us on a mission to change the timeline for yourself. And you won't even let us look at our futures? Now, I know this city better than anyone else, and you're gonna need me out there. So either I'm coming with, or we can find out if the Time Masters are as good at teaching people to fight as the League of Assassins. Rory: Ah, isn't the future great? Snart: We really should be getting back to Rip and Sara. Snart: 'Cause I'm not looking to put down roots here. Rory: Why not? It's everything we've ever wanted. I got a gang that does everything I tell them to. I got a fur coat. I got a chalice! Sara: Everyone thinks that you're dead. Oliver; They're not wrong. (to the new Green Arrow) Put the arrow down, John. You're embarrassing yourself. Connor: My dad is dead because I couldn't save him. I don't deserve his name. I'm Connor Hawke. Oliver: So you won't take his name, but it's all right to parade around in someone else's outfit? Connor: Well, someone has to, because last time that I checked, you were dead. Stein: Is there something wrong, Ms. Lance? Sara: Well, all my friends and family are dead, except for Oliver Queen, who happens to be dead inside and missing his left arm. Sara: That this is just a potential future and that it's all gonna go back when we return to 2016... if we return. But what if we don't? We all know Carter's not coming back! It's not like we have the safest line of work. Jax: I think if Sara wants to stay and help that then we should. I mean, that's what we signed up for: to be heroes. Stein: I agree with Jefferson. Rip: Yes, of course you both do, because neither of you understand the pitfalls of changing the timeline. Meddling with the future is arguably more dangerous than changing the past, because it is still in flux. Sara: Your wife and son's death are in the future. You want us to change that. Rip: Do not play that card with me. Sara: So what? Are you only willing to risk the timeline if it's your own family? Rip: I am not just trying to save my family and I'm not just trying to save one city, but the entire world! I'm not the one being selfish, Sara. Oliver: Thought I told you to go. Sara: Grant Wilson has Connor. They're gonna kill him. Oliver: He knew what he was signing up for and you know there's nothing I can do to help him. Sara: That's not the Oliver Queen that I know. Oliver: Maybe I'm not that person anymore. Look at me, Sara. I'm literally half the man I used to be. Sara: Then that's the half this city needs. He's got too many men, Ollie. I can't do this by myself. Oliver: What about your friends? Sara: I'm on my own... unless I'm not. Sara: I never got the chance to ask Connor why he wears the hood. But I know why. It's because this city will always need a Green Arrow. Oliver: That's good shooting, John. Oliver: Either way, it's Green Arrow. Rip: I'm just working on determining our next destination. I've considered your suggestion of Hell, but I think I'll give it a miss for the time being. Sara: I just wanted to say thank you for sending the team to back me up. Rip: As it turns out, you were right. Sara: That must have been hard to say. Rip: Of late I've discovered that I still have a lot to learn, I admit. Including the fact that every future is worth fighting for. That said... this mission is going to continue to present us with difficult choices, and I need to know that you are a member of this team. In a past life, Kendra worked as a shipyard welder in 1944. Stein refers to meeting his past self in 102. Snart refers to Rory and Palmer becoming buddy-buddy in 105. Snart refers to pulling a heists on a Blackhawk armored truck. Blackhawk Securities first appeared in A111. Reference is made to an Uprising in 2031, in which most of the heroes of Star City died. Snart refers to pulling a heist on a Blackhawk armored truck and a job a the Del Ray Security Exchange with Rory at some point in the past. Generally enjoyable, though we could have spent more time developing the future Star City and less time on Ray and Jax suddenly competing over Kendra - a move that seems to have come out of nowhere and seems rather tasteless given how recently Carter died. Connor Hawke and Grant Wilson are barely touched upon and it would have been nice to have some explanation for why John Diggle Jr. chose that alias.